Former Haitian president Michel Martelly made sure everyone was talking about him, good or bad, during the Labor day weekend in New York. Martelly stole the show! 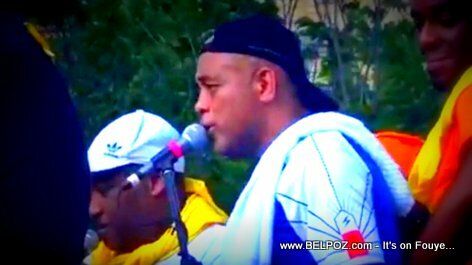 Martelly know this... "Qu'on parle de moi en bien ou en mal, peu importe. L'essentiel, c'est qu'on parle de moi!" Translation: Whether you talk about me for good or bad, it does not matter. The bottom line is that you talk about me. This is a famous quote by French Journalist Léon Zitrone. On Haitian radio and on the Haitian social media network the news was buzzing around Sweet Micky, Michel Martelly. Thousands of Sweet Micky fans were on Eastern Parkway in Brooklyn New York enjoying the sounds of Carnival with Sweet Micky the other Haitian bands who were there. Those who were against the former Tet Kale president of Haiti also attended the parade to protest against him asking for the PetroCaribe money.